I’m using Ozone on a Windows 10 Pro 64bit host, with a Segger J-Link debug probe and the Segger Ozone version V2.20h and FreeRTOS V9.0.0. The project used here is available on GitHub for the NXP/Freescale FRDM-K64F board. 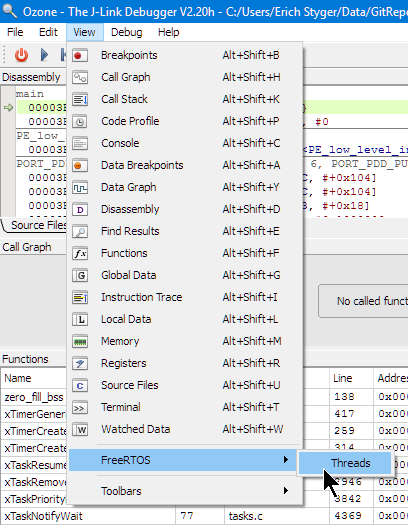 This article shows the needed steps to see FreeRTOS threads in the Segger Ozone debugger. This entry was posted in ARM, Boards, CPU's, Debugging, Embedded, FRDM-K64F120M, Freescale, Kinetis, NXP, Ozone, Tips & Tricks and tagged Debugging, FRDM-K64F, freedom board, FreeRTOS, Freescale, NXP, Ozone, Segger, software project, technology, Tips&Tricks by Erich Styger. Bookmark the permalink.